The Razer Krait 2013 is named after a venomous snake - like all their other Razer mice. The Krait is currently on the Chinese razer website. I once again sourced mine through a contact that lives in China and was able to purchase one on my behalf. I'm assuming the reason they are not available so readily is that Razer just wanted something at a cheaper price point for that market. I'm always keen to try peripherals that are not common. This is a break from the current line up from Razer, who has been re-branding and updating many of their popular products. I'm sure many of you have seen the re-released DeathAdder 2013 and Naga 2014, with the green backlight. The Krait is different in several ways, the backlight is orange and there is no soft rubber coating. Instead of the rubber coating used on many of their current and former line up, they have used a textured plastic. Some might find that to be a bad choice, I happen to think that the feel of the textured plastic is nice. The left and right mouse buttons have a very grippy texture, while the sides have a knobby texture providing a solid grip to help control the mouse. The scroll wheel is also back-lit orange. The wheel is noticeably thinner than many of their other mice I have had in the past. The wheel doesn't stand as high up from the surface of the mouse. This doesn't pose any problems using the wheel, it works well with the overall slenderness of the mouse. I personally find the mouse to be a bit too slender, as I have largish hands. This is probably the only real issue I have with the mouse - it is not for people with large hands. It did seem to work very well if I tried using it with either a finger or claw grip. My hand is just too big to try to feel comfortable using the palm grip, with my fingers hanging well over the front of the mouse buttons. The overall construction is pretty good. It does feel very light and at times can seem a little fragile. The mouse buttons registered well from all angles and were nice and clean. The scroll wheel is smooth and at times felt quite light. The Rubber grip on the wheel is very thin and I'm sure it will get worn out at some point. The cable has a plastic coating, which is a big departure from almost all the other Razer products currently on the market. But this being an "essential" entry level mouse from Razer, this is not a bad thing at all. The design and construction ques are there from all the other higher models. The optical sensor is pretty neat - it tracks well and seems to respond consistently on a number of different surfaces. I did find that at the 6400DPI setting the pointer did seem to accelerate intermittently, this could be due to my less than a clean surface. For me it seems the smoothest at around 2400 to 3200 DPI, I rarely see the point of adjusting the DPI above 3200 DPI. Downloading the Synapse installer is a breeze. It's only 12.5MB ( version 1.15.04 Windows ). The Synapse software is available for Windows and Mac. There is an unofficial set of drivers for Linux which supports the Krait called razercfg. The Linux drivers are still actively being supported and I hope to see them improve over time, especially with a steam machine not too far away. Installation of the windows drivers goes pretty quick. Once you start the Synapse software you are prompted for your Synapse user details or to register. 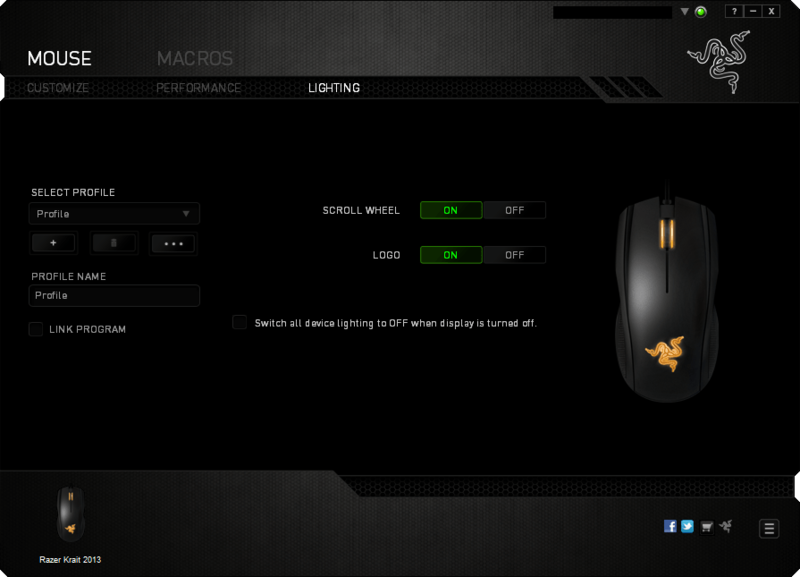 This is the bit that I'm not a huge fan of, its great that Razer provides a cloud solution for my settings and macros. You can go into an off-line mode once you have logged in, but without the Synapse software account, you cannot configure the mouse or macros to its fullest. Once I logged into my Synapse account it detected the Krait and downloaded additional drivers specific to the mouse. The download for the Krait drivers was automated and I didn't have to do a thing. It then did something that I hate when it comes to installing a mouse - it wanted to restart windows... Once I restarted windows and opened the Synapse software it was all good. The software is very good and well organised, and the krait has a few more features that you might expect from an entry-level mouse. 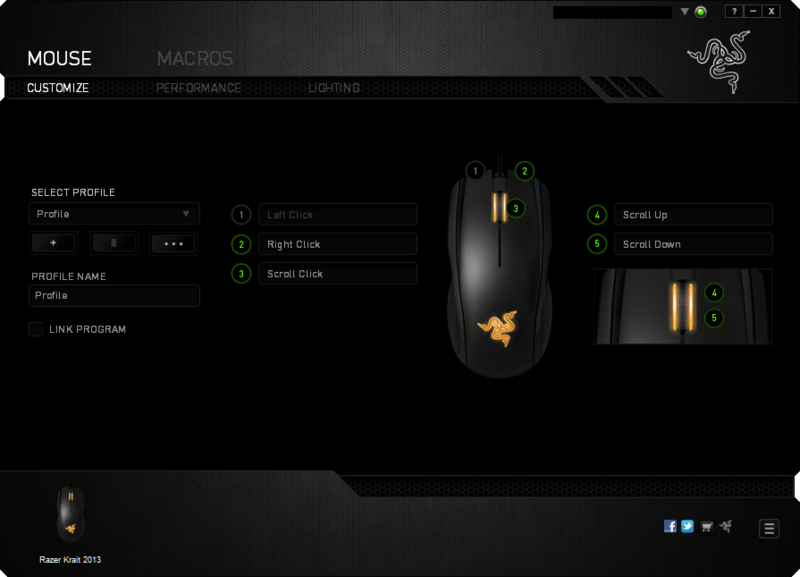 The Synapse software separates the macro management from the actual mouse configuration. This a pretty neat idea - as you can define all the macros in the world and then use them with your mouse or any Razer product. 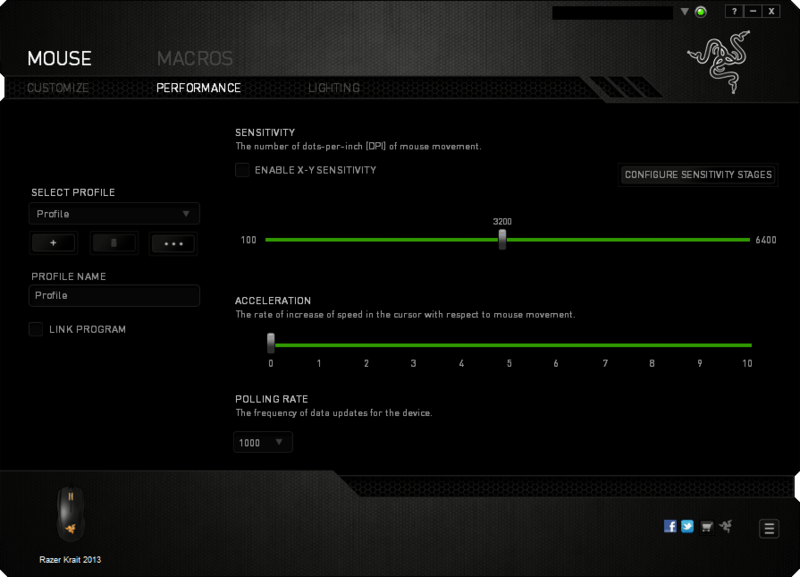 You can adjust the DPI for your mouse, and even have different DPI's for the X and Y axis. 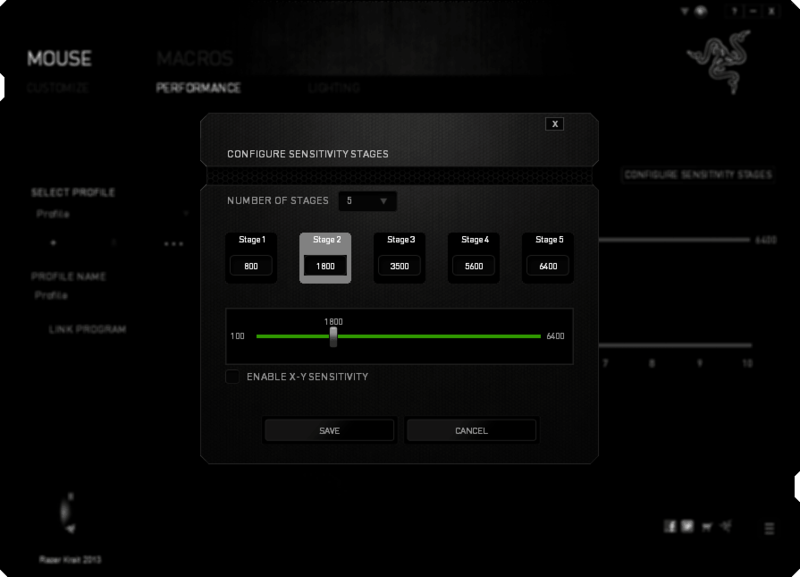 You can configure the number of predefined stages and the DPI setting for each stage. There's not much we can do with the lighting, we can turn on and off the two independent zones: the scroll wheel and the logo on the palm rest of the mouse.